The Carolina Trio is the premiere wedding group of the Charleston, South Carolina area! 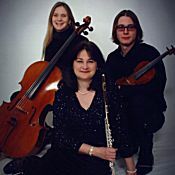 This trio (flute, violin, and cello) consists of all classically trained musicians who have graduated from top music schools from across the country. All of the musicians are members of the acclaimed Charleston Symphony Orchestra and have performed with this ensemble for several years.